Not long after the children arrived in Bengjan, they caught a quick look at the ghost’s terrifying real face while she thought she was alone in her room. Luckily the kids got away without her knowing what they had seen, or surely she would have eaten them. Finally, knowing for certain that they hadn’t been imagining things when their mother fell off the boat and that they were living with a ghost, they decided they had to do something to save Nang Phom Hom. They knew they could not convince their father to do anything, so their only hope was to find her by themselves. So early one morning they snuck out of the palace and headed for the forest. The children were tired and afraid, but utterly determined and they walked all over the forest shouting out for their mom. As they got far away from the palace they heard many wild animals, did not succumb to their fears and always kept walking. In the afternoon Nang Phom Hom was shocked to hear her children’s voices and she rushed through the treetops to find them. And when the kids saw her, they knew that the monkey was really their mother. They all hugged and cried. The kids told their mom how much they missed her and loved her and Nang Phom Hom answered with head shaking and finger pointing as best as she could. After they talked for a little while, Sila said they needed to leave so they would be out of the forest before dark. But Nang Phom Hom would not go with them. She missed her family a lot, but protecting them was the most important thing and so she had decided to stay and live out her days as a monkey in the forest. If she did anything else, it could provoke the ghost to kill them all. When their mother refused to follow them back toward the city, the kids became sad. Sila told his mother to stay in this place so they could find her again. They would figure out a way to get rid of the ghost and break her monkey spell. The children walked home alone. Back at home the kids told their dad that they had found their real mother. Tarangsit had recently noticed some odd behavior by his wife and when he heard his kids’ story he thought again about the incident on the boat; so now he finally believed them. Tarangsit was both sad and angry and determined to get Nang Phom Hom back. He told his kids that it was important they not say a word about this to anyone else so the ghost won’t hear about it. Tarangsit consulted a rue-sii to learn how to defeat the ghost and save Nang Phom Hom, then he met with the commander-in-chief to tell him the plan – nobody else could know or the ghost might know something is up. 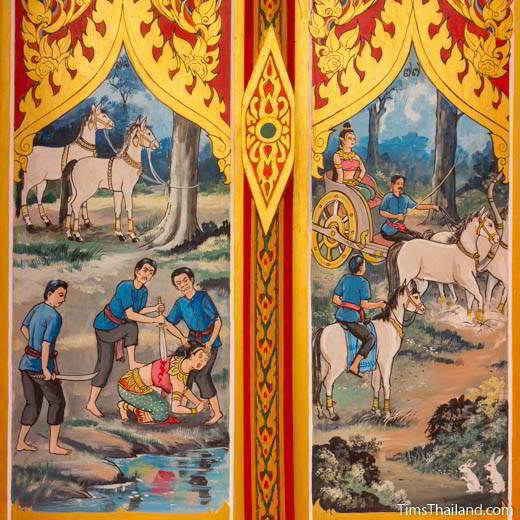 In the morning Tarangsit banged the royal drum calling all citizens to assemble and warned them that an enemy was coming to attack the city. He was going to lead the army out to the countryside to defeat them and everybody else should stay inside the city walls until it was safe again. Out in the forest next to a lake, the soldiers built a pavilion that was supposed to be Tarangsit’s base of operations during the war. 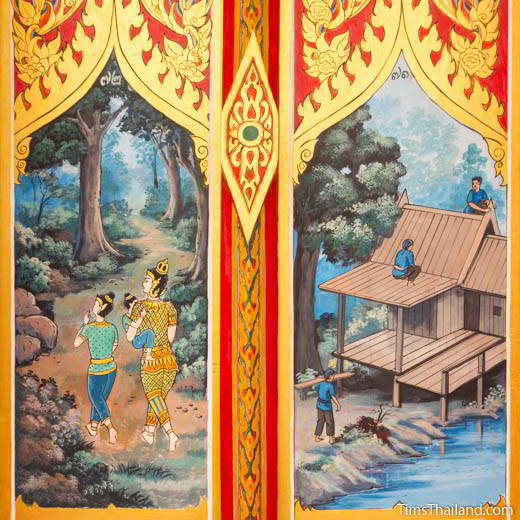 But soon after arriving there, Tarangsit and his children slipped away into the forest to go find Nang Phom Hom. When they neared the place where Nang Phom Hom had been before, Tarangsit stayed back and the kids went forth calling out for their mom. He worried that if she saw him, she would be too embarrassed to show herself. When Nang Phom Hom heard her children, she did not come down from her tree. As much as she missed her kids, she wanted to protect them, and any time they came to the forest to see her they were in danger from wild animals and possibly the ghost. But she missed them so dearly that she couldn’t resist anymore and ran down to hug them. When the time was right, Sila called out to his father to come join them. 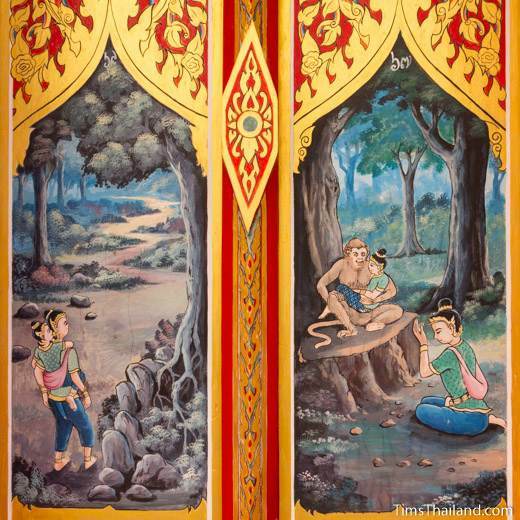 Tarangsit smelled the monkey’s fragrant hair even before he could see her and knew this really was Nang Phom Hom. 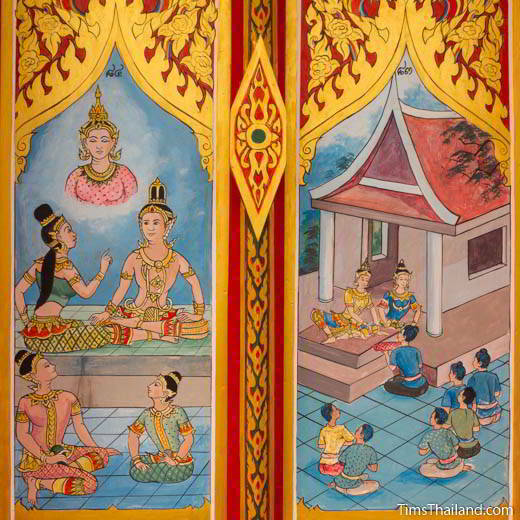 The two embraced and cried, and Tarangsit begged his wife to forgive him for leaving her behind in the river. She made it clear that she did. Then Tarangsit explained his plan to kill the ghost and make Nang Phom Hom human again. She needed to come with him to near the camp, but stay back in the trees until he called for her. She couldn’t show herself to anyone before then. That night the ghost dreamed that her hair fell out, the water she bathed in turned red, and the palace was damaged. She did not know what it meant. Back at the camp, Tarangsit called for three strong, trusted soldiers and informed them that there was no enemy invasion, rather he was going to murder the ghost who was impersonating his wife. He sent them back to the palace to tell her that the war had been won and Tarangsit needed her to come be part of the victory ceremony to ensure good luck for the kingdom. 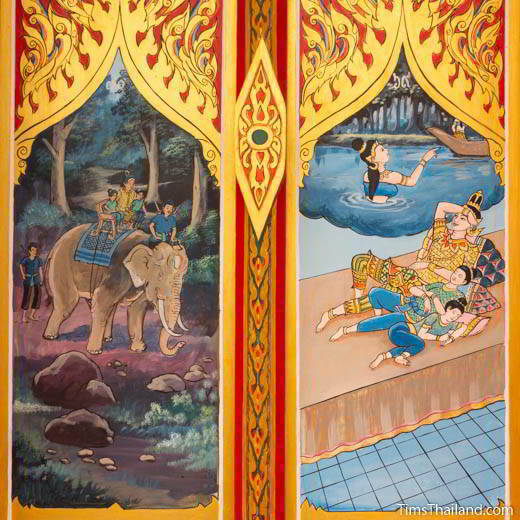 After the ghost washed her hair and put on her best clothes, making herself beautiful to please Tarangsit, the soldiers drove her out of the city in a chariot. Once they were in the forest they stopped for a drink of water, and then one of the soldiers stabbed his knife into the unsuspecting ghost’s back. She screamed and thrashed about and lost her human form. The soldiers saw her grotesque real face as they held her down and chopped off her head. As they’d been ordered, the soldiers brought Tarangsit a pot full of her blood, gathered as it flowed out from her severed neck. 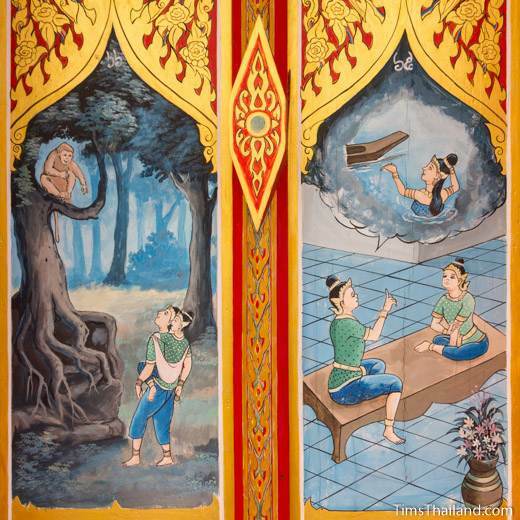 Tarangsit called Nang Phom Hom out of hiding and told her that the monkey spell would be broken if she bathed in the ghost’s blood. She waded into the lake, poured the blood over her head, and was restored. 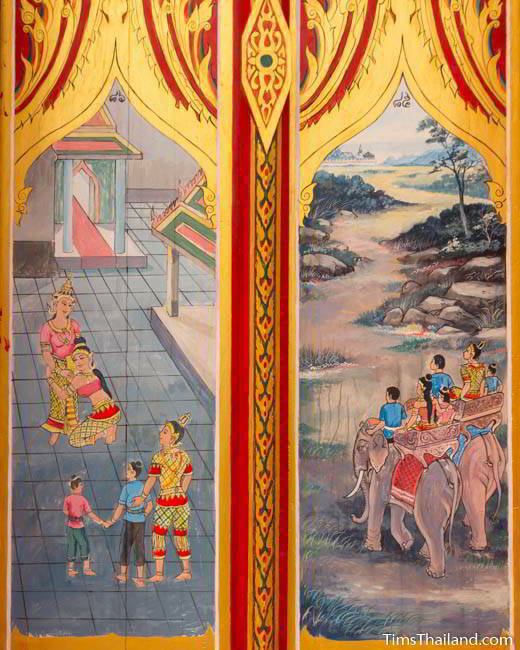 The family rode back together to the city and Nang Phom Hom was greeted warmly by the king and the queen. After a bai-sii su kwan ceremony in the palace, there was a large celebration with music and theater throughout the city. Tarangsit had proven his bravery, loyalty, and intelligence, and his father decided that now was the right time to pass the throne to his son. 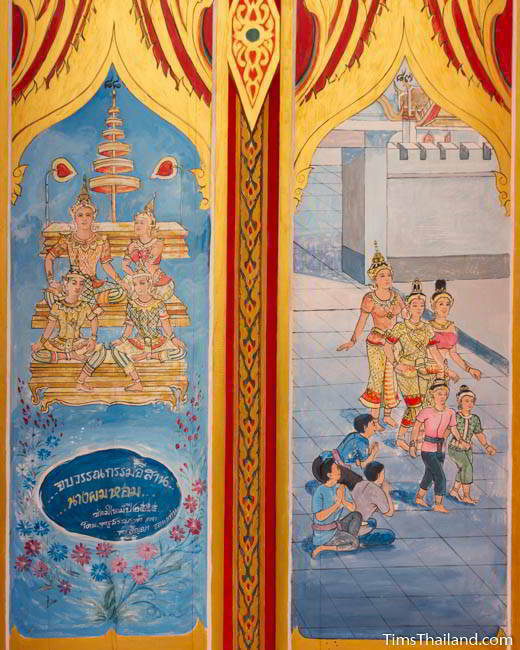 Everyone in the city, from the royal ministers to the slaves cheered the news that Tarangsit and Nang Phom Hom were going to become king and queen. While Nang Phom Hom was happy and had a comfortable life in Bengjan, she thought of her mother often. 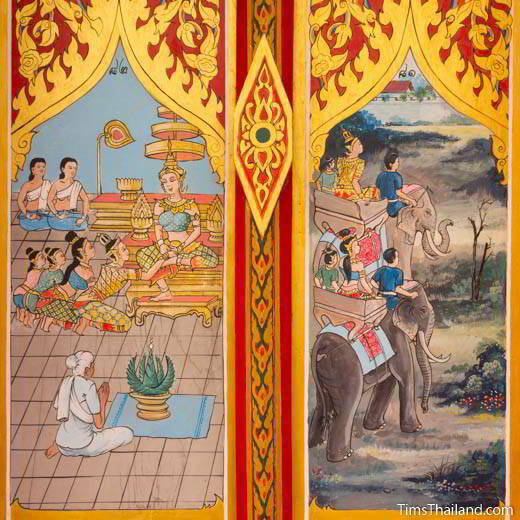 When the time was right, she told Tarangsit that she wanted to go see her. So the family went to Nakhon Sri Ratchathani, traveling in a large royal procession. Nang Phom Hom was ecstatic to see her family again. She threw herself at her mother’s feet, paying respect to her and begging forgiveness. Nang Sida forgave her daughter, and said she understood that leaving had been a part of her karma, just like she herself couldn’t not go into the forest in her own time. Nang Phom Hom asked her mother to come to live with her, and she agreed. They all returned to Bengjan and, of course, lived happily ever after with vast wealth and good health.